The ideal Philippines region for wrecks and pelagic lovers. The island province of Palawan and Tubbataha Reefs are some of the most diverse and captivating in the Philippines archipelago. 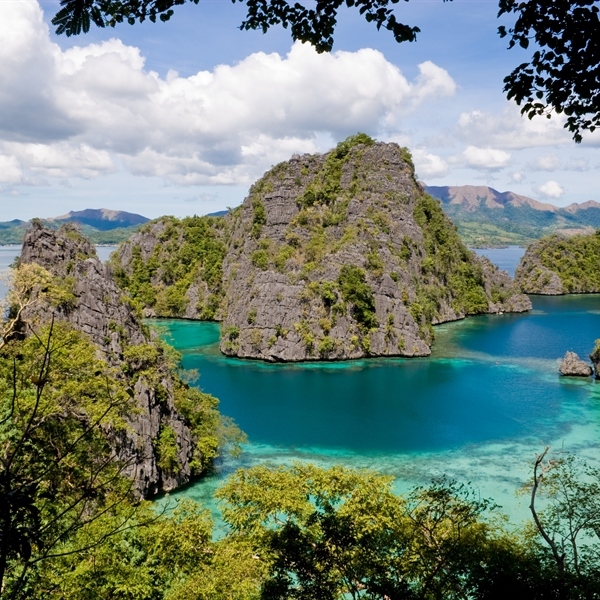 Palawan is home to rugged steep limestone rocks, white sandy beaches and rich turquoise waters. Palawan and the surrounding area are often described as the Philippines last frontier because of the large number of remote islands in this part of the country, the low population density and the most incredible sceneries. Such beauty is also experienced underwater in the colourful, shallow and pristine slopping reefs. Tubbataha is the pinnacle of diving in this area and the Philippines with more crystal clear waters, colourful reefs and a myriad of pelagic life. Diving holidays in Coron, Philippines aboard the Philippines Siren. Just imagine yourself cruising along the beautiful limestone islets whilst passing by and diving multitudes of coral reefs with their wonderful pastel colours and shades of aqua greens! This is exactly what you have waiting for you in this part of the Philippines. Coron Bay is home to the best wreck diving in the Philippines. With at least 11 Japanese WWII ships lying in nearby waters, Coron has become a world class diving destination attracting wreck diving enthusiasts from around the globe. The Coron Hilltop View Resort s ideally located near the airstrip and jetty offering peace and tranquility with access to breath-taking WW2 wreck diving. Sangat Island home to the Sangat Island Dive Resort is one of the limestone islands in the region with three white sand beaches edged by sheer limestone cliffs, dense jungle forestation and a 455 metre mountain peak. The island also features a marine park and sanctuary with over 75% of the reefs remaining intact and very healthy. The island’s location nestled alongside the extreme northern boundary of Coron Bay makes the ideal base for your wreck diving holiday. Further away, but also accessible on day trips are 6 other large wrecks including the Akitsushima, Taiei Maru, Olympia Maru, Irako, Tangat and Kogyo Maru. These wrecks are thrilling dives sites that will remain in your memory forever. Some are more challenging than others but they all sit at maximum depths between 24 and 42 metres making it accessible to experienced divers. In the grassy underwater slopes around Dimakya Island, home to Club Paradise you will find dugongs. These shy creatures are globally endangered and there are only a few places left to see them. Viewing dugongs in their natural habitat is an incredible experience. The island also has pristine white sand beaches, a beautiful and colorful house reef and a countless outdoor activities assuring you have the most indulgent stay. 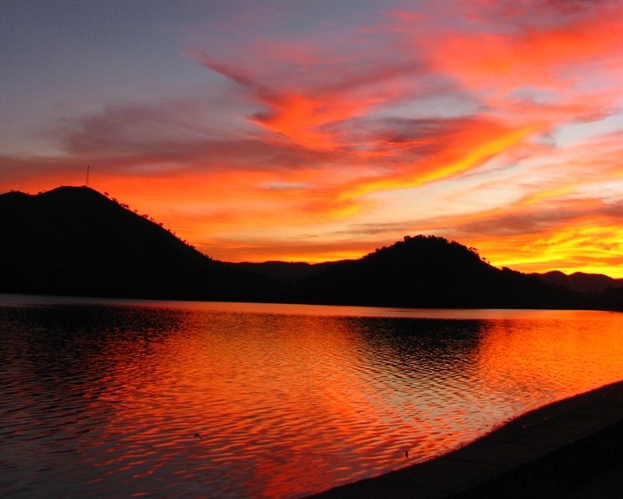 Coron and the surrounding islands are not famed for nightlife therefore the evenings are calm and relaxing. You can choose to enjoy the surroundings from your room balcony or join other divers for a refreshing and quiet drink at the resort’s bar or restaurant. El Nido is a magical place on the northern tip of Palawan. This little piece of paradise offers ageless towering marble cliffs, enchanting lagoons, caves, white sand beaches, crystal clear waters and over 30 dive sites to choose from for varying diver levels and skills. In El Nido you can take the plunge and learn to dive for the first time, perfect your expertise and advance your qualifications, enjoy great diving tours or just relax on a magical beach, the choice is yours! 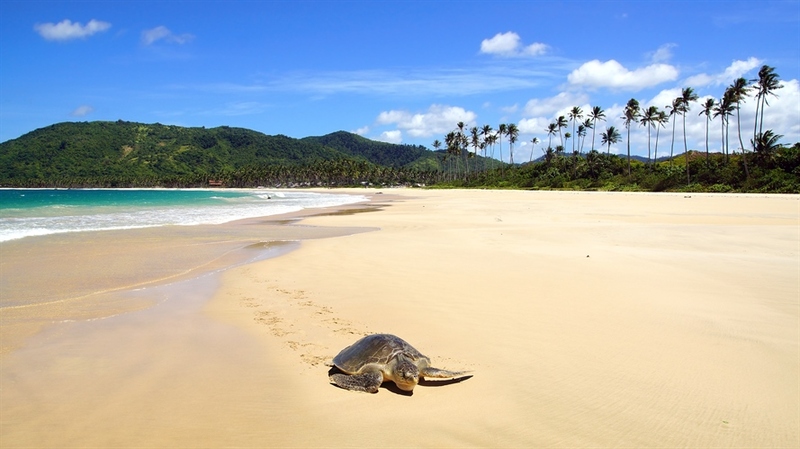 El Nido's Bay is rich in marine life and a holiday here will give you the opportunity to see an array of wildlife including dugongs, turtles, manta rays and the occasional whale shark plus a range of colourful corals, beautiful walls and intriguing tunnels. Island hopping is one of the main attractions in this part of the Philippines when you are not diving and you can easily find over 50 beaches in the marine reserve of Bacuit Bay alone. If you are feeling adventures you can also take part on cliff climbing, go cave exploring or visit one of the many waterfalls. The fast-growing tourism of Palawan has led to the establishment of a good number of bars and restaurants in the El Nido area offering a good time for both the visitors and the locals. If you are staying on the islands around the El Nido area, the resort’s bars and restaurants are a great place to relax and unwind after a hard day’s diving. Tubbataha Reefs National Park is one of the largest continuous reefs in the Philippines providing a centre of attraction for large schools of fish, turtles, countless shark encounters and manta rays. 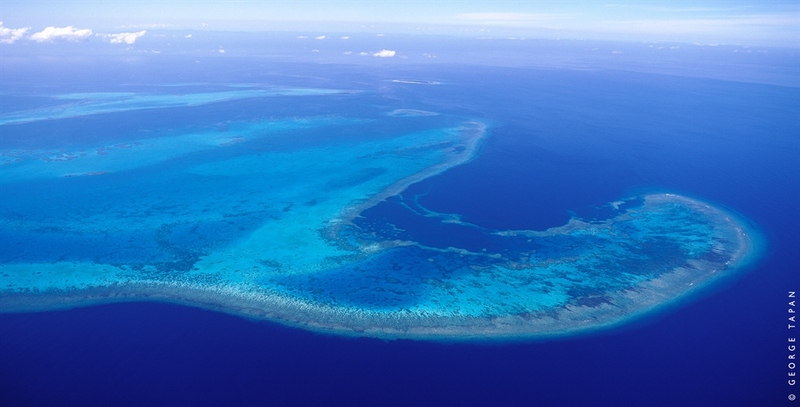 The area was declared a World Natural Heritage Site by UNESCO in 1993 and for a good reason as it is home to a unique example of an atoll system with a high density of marine life. Getting to this beautiful part of the Philippines often starts with a flight from Manila to Puerto Princesa followed by an overnight journey of 10 hours on the liveaboard giving you plenty time to get to know your fellow divers and explore the boat. The overall diving quality in this protected area is truly outstanding and well worth the trip. Barracuda Lake in Coron is another unusual and interesting dive. Firstly, you will have to climb up a limestone mountain in full gear for 15 to 20 minutes until you arrive at the lake. Then there's a 33 metre dive to a cave with 30 metres of penetration. The cave is situated on the north wall of the lake and so called for its resident barracuda who may descend to show you around. The opportunities for photography at this point are excellent. Water temperatures vary from 30 to 38 Degrees Celsius, so prepare to "boil" for a while. The variation in temperature is so large that you can feel the thermoclines. The cave is marked with a fixed line on the right side as you enter and it is just big enough for one diver at a time to go in and turn around. The cave is dark and there's a lot of sediment, so a light with backup and an alternative air source are essential. This is a site not to be missed! Cathedral Cave in Coron is situated on the south end of the Island on the east side directly connected to the sea. It starts at a depth of 6 metres through a man-sized tunnel in the sheer rock face of the island itself. As you pass through the tunnel and descend to 12 metres, look out for lobsters. After a short swim, you will see a beam of daylight penetrating from a crevice higher up the outside of the rock face where a full-sized tree has fallen onto a sand mound in the middle of the cave. Once you cross this mound slightly to the left is another passage that leads to a chamber with an air pocket just above sea level. Pass back through the tunnels to open sea and admire the colourful corals in 20 to 30 metres visibility. Shark Airport in Tubbataha is found on the north atoll and is one of the best places for spotting a variety of marine life including endangered sea turtles, white-tip reef sharks and plenty of different corals. 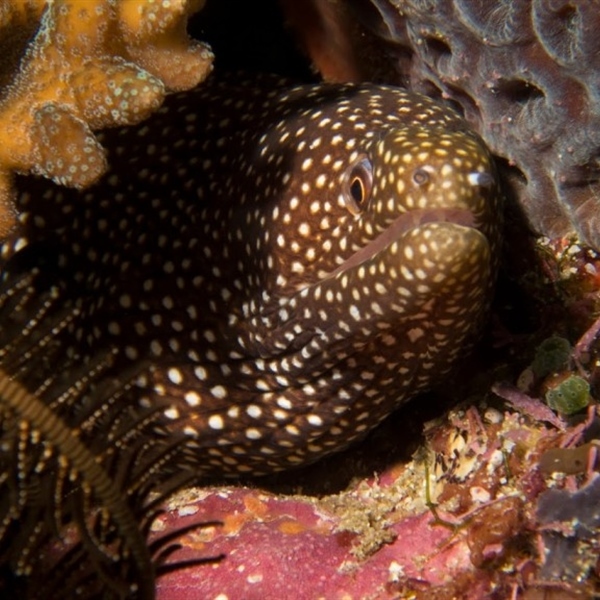 You may also see whale sharks, thresher sharks and even pygmy seahorses. Bird Island in Tubbataha is a very popular site also located on the north atoll. There is something for everyone here from crevices and swim-throughs to steep walls with overhangs home to a variety of marine life. 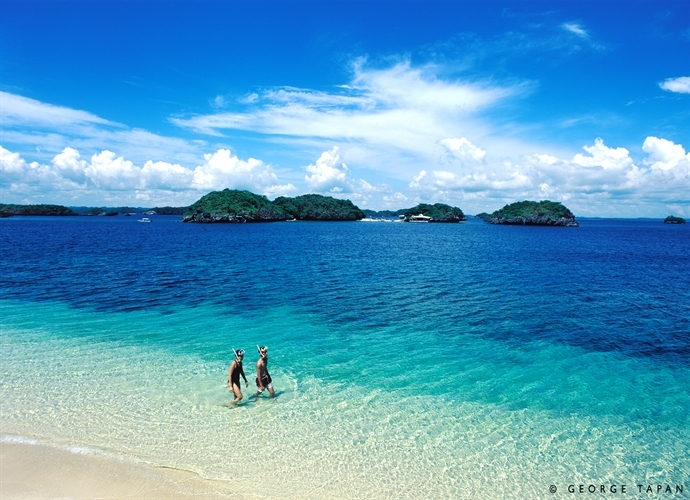 It is possible to dive Coron and surrounding area year round. 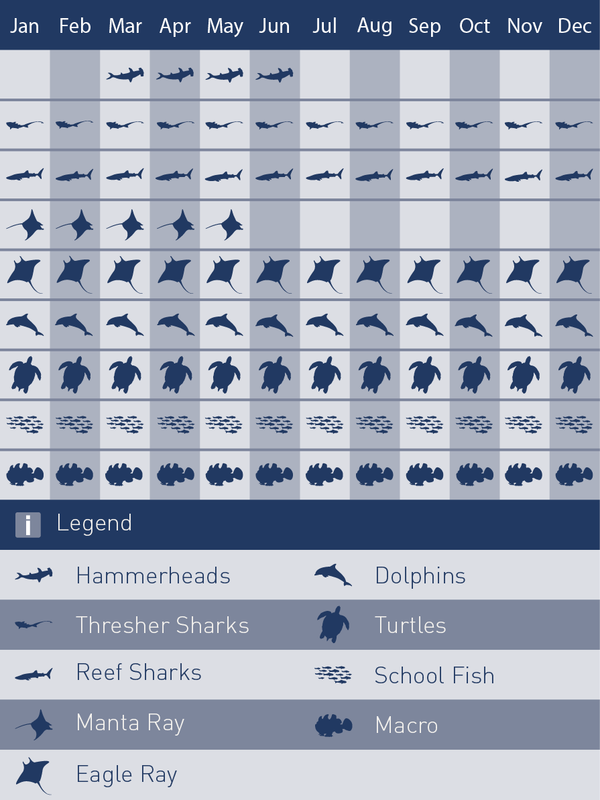 However, you may experience some bad weather during the wet season which runs from June to September and can sometimes prevent some of the diving activities. 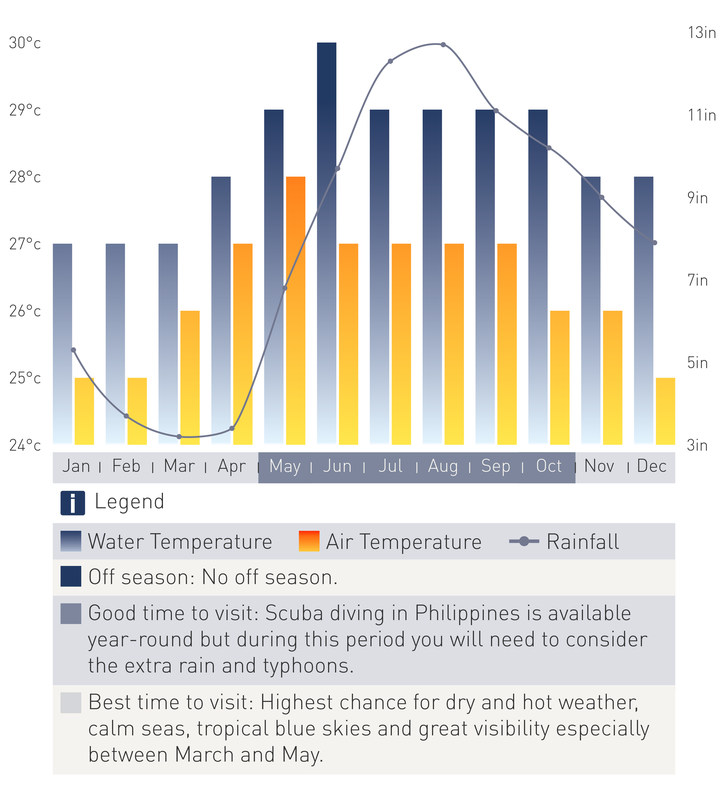 The best diving season is from December to the end of March as this is when the sun is shining and the visibility is at its best and up to 15 metres. Due to its isolated location, Tubbataha can only be visited on a liveaboard boat and between mid-March and mid-June when divers can experience the reefs' dramatic underwater terrain and awe-inspiring biodiversity with clear skies, calm seas and visibility between 30 and 45 metres. Due to its isolated location, Tubbataha can only be visited on a liveaboard boat and between mid-March and mid-June when divers can experience the reefs' dramatic underwater terrain and awe-inspiring biodiversity with clear skies, calm seas and visibility between 30 and 45 metres.